I noticed this app as well and I agree it is somewhat of a gimmick. 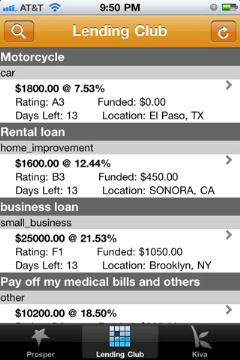 What I would like to see is one of the Stats sites such as Lendstats.com or Ericscc.com come out with an iPhone app. Better still, Lending Club or Prosper should come out with one where you can keep track of your own portfolio and do reinvestments. Can’t imagine it would be that hard.